Honestly, I have to admit that I was nervous, very nervous. For the first time in a number of years I stood there ready to ride out on a fixed wheel road bike. My whole thought process and loose ride planning methodology was suddenly compromised. Normally I’d ride out of my gaff, over a few potholes and slatted drains, up a steep ramp and out onto a busy main road. This is then followed by some up’s, some down’s, many bump’s, all sprinkled with sectors of gravel and grit. Now, I found my self looking at that same short ramp, those potholes and the tyre width drainage slats that led to the main road and trying to figure out whether I could actually make it up and then turn before I hit the slits and went and headlong into the ground. That was not to mention whether I should turn left or right – to face the traffic weaving or the struggle of the hills. The joys of fixed wheel road riding are a plenty, and that’s for sure, although in a split second I’d been rapidly reminded of the stresses and strategy required in the process of attaining this one geared purity. I’d long since had my aging track frame hanging in the bike store. I didn’t quite know what to do with it; I mean, I’m not going to race it again, and I couldn’t get the parts to put this steel threaded air loom back together, and there seemed little point in turning into a themed table lamp, so I decided to bodge and burn it back into usable shape, road going shape. In the distant days of toe clips and hairnet helmets riding a fixed wheel bike on the road was pretty much standard practice, both out of necessity and also for the numerous training benefits to be gained. For years I rode an old steel fixed wheel bike (that was almost twice as old as me) all through the winter. The same bike would then be geared up for weekly track racing through the summer, and also hit the roads for occasional time trial or hill climb race, which was nothing particularly unusual. Many of the great pro riders of past also trained through the winter on fixed wheels – riders such as Stephen Roche for example. As for hitting the road against the clock, there are still top pro’s occasionally doing that – when regulations permit. The reasons? 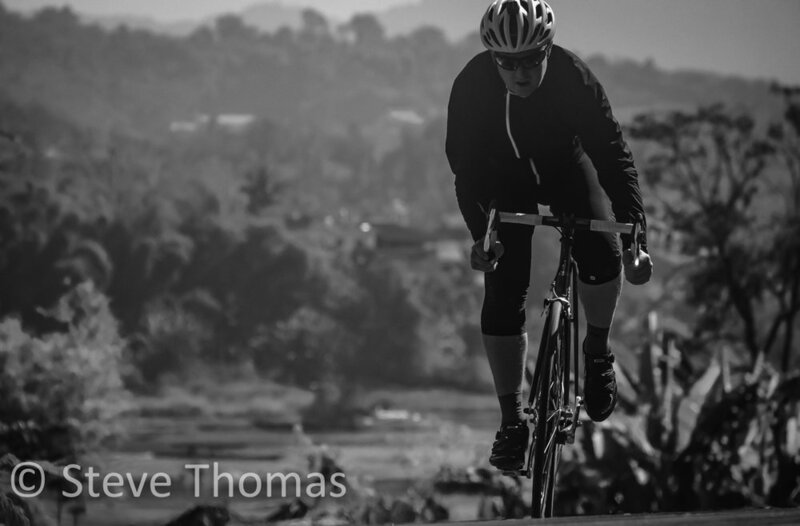 From a training standpoint riding fixed is superb for all-round conditioning, as there is no down time. It forces you to pedal at whatever rate form and terrain permit, which is usually faster and more fluid than you would on a pedal road bike, where you have the choice to change up and down on a whim. Riding fixed forces you to refine your pedal stroke and vastly improves souplesse, a term seemingly long lost. Then of course there’s the simplicity and practical aspects; mechanically it’s about as straight forward as it gets. There will be no slipping gears, jumping sprockets, electronic shift issues, and of course – you’ll never have to think about gearing, plus, you’ll be saving a good chunk of weight. However, there are naturally a whole heap of downsides too, which were shockingly brought back to me like a demon from the past. You really do have to work on your planning, and think a whole lot more about where and when you’re going to ride. Big hills can be conquered, if the gearing choice is right, although then you will have some wide-eyed and hair-raising moments on the way down the other side; hence. Flat to rolling routes and a gear that fits is more appropriate (unless you’re Patrick Seabase that is). Potholes, railway crossings, wet roads, sharp turns and gravel also need to approached much differently, as you cannot just stand up on the pedals to soften the blows, and you will be pedalling the whole time, meaning that pedals could clip the ground. After a few rides it does become second nature – as long as you don’t forget you’re on a fixed wheel, which is all too easy to do, and often ends in terror or a heap. Riding fixed on the open road is definitely more mentally taxing, so you’ll probably want to keep it short and sharp. There’s also the pacing issue; you will be limited in range here; a few clicks faster and you’ll be spinning out, a draggy headwind or a climb and you’ll be slugging it out. This means that you need to be wise with who you ride with as well as where you ride. Working around practical build constrictions I managed to get a pair of fixed hub wheels built at a local bike shop (but use a regular road front wheel for the braking surface). Thanks to the fading revival if the fixie, bright and bold fixie parts are readily available, even if they’re not quite to my retro-conservative and non-skidding taste. Not being one to skip the brakes I got an old pair of thread-less road forks (with a brake drilling) and then also fitted a threaded headset with an A-headset stem to champ it in place – which works surprisingly well. Online I found some regular brake levers, bought a fixed crankset and sprockets, added a coloured chain and all was good to go. Most budget single cranksets I found were 46/48-tooth, which I tried, but were just over-geared for my fitness levels. In the end I used an aging tapered double crankset and converted to use just the 42 tooth inner ring, and then fitted an 18-tooth rear sprocket – the same gearing I used to ride through the winters many years ago. So far I’ve only taken one rolling ride out on the beast. It was a real shock to the system; my position has changed so much over the years, so I will need to flip the stem for a higher outlook, go for a shorter reach, and maybe drop the saddle a snip too. Even after a short ride out my body ached in places it hasn’t for a while – it was a bit like going to the gym for the first time. Uphill was a grunt, on the flat it was as pure and sweet as, and downhill it was focussing, and a blast. Overall it was something of a ride down memory lane, where I underlined what I already knew – that I’m nowhere near as fit as I once was. That said, it was fun, and there was that sense of clean purity to riding fixed on the road again. The intent of this project was not just to re-utilise that old steel back buster, more to re-educate myself with the fine art of pedalling. If you don’t have a fixed bike around then with old parts and a lot of searching in the dark corners of older bike shops who can cut and shove something together, or better still buy a cheap fixie and adapt it. You really should taste one-geared goodness; it could be something of an eye-opener, especially going downhill.